Encompassing Washington, Oregon and Idaho, the Northwest region’s diverse landscapes range from the marine waters off the coast and in Puget Sound to the old growth forests of the Cascade Mountains and the arid high desert of the interior basins and its plateaus. Pressing for officials to implement science-based management plans for gray wolves, grizzly bears, orcas and sage-grouse. Engaging in landscape-level planning processes that benefit multiple species in the Pacific Northwest. 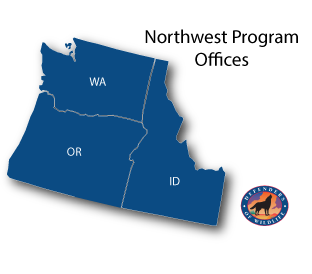 Working as part of the Washington Wolf Advisory Group and other local and regional efforts to promote coexistence solutions thereby reducing conflicts between wolves and livestock and ensuring long-term recovery of wolves. Actively engaging in the effort to reintroduce West Coast fishers to the Cascade mountains in Washington state. Actively engaging with federal officials and local partners in the planning effort to restore grizzly bears to the North Cascades. Promoting conservation planning for sage-grouse that accommodates responsible siting for smart, clean energy development across the West. Advocating ways to reduce pollution in Puget Sound and remove outdated dams from rivers in the region to restore salmon and the Southern Resident orcas that depend on those salmon. Pressing for a complete conservation strategy and permanent protection of nesting habitat for the marbled murrelet on state lands. Partnering with coexistence programs in the Selkirk Mountains of eastern Washington and northern Idaho to provide pragmatic and proven solutions for avoiding conflicts between people and grizzlies. Mobilizing opposition within Idaho to the state’s wolf eradication program.